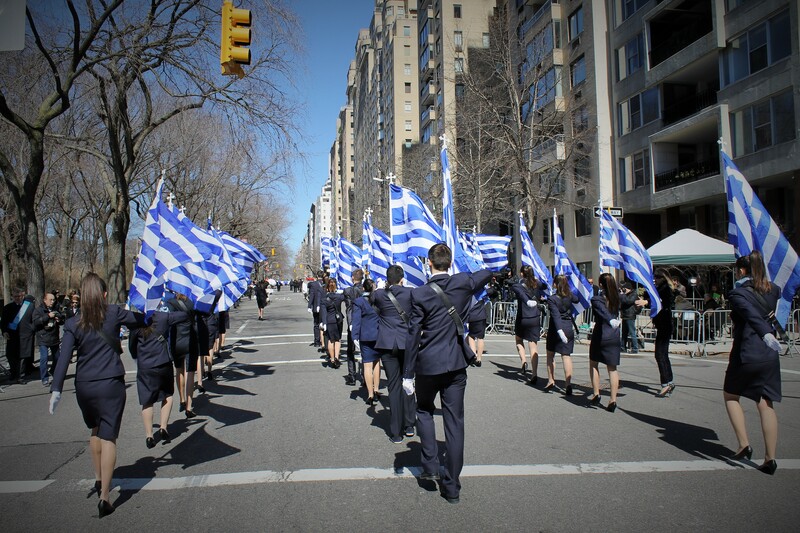 A Sea of Blue Shine for the Greeks on 5th Ave. 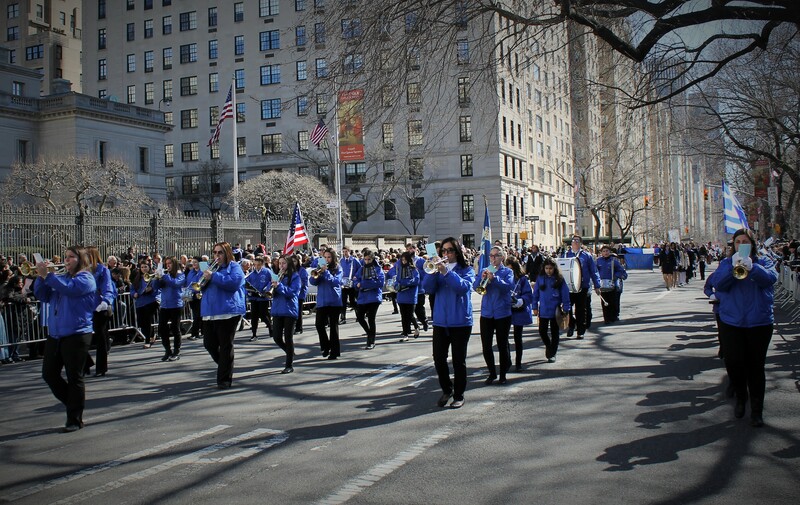 Early spring still had a chill in the air but that didn’t stop the thousands of revelers from lining 5th Ave. from 63rd to 79th Sts. 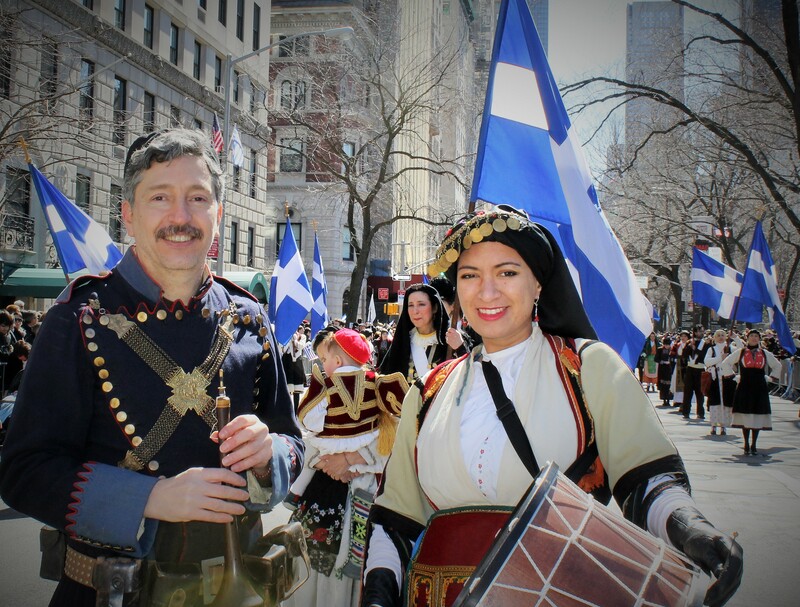 to celebrate the 194th anniversary of Greek Independence from Ottoman rule. It was a festive occasion although it was not without incident. As with most major parades, the mounted police signal the start of the parade. Nearby the reviewing stand near 68th st., a mounted police officer was thrown from his horse when it got spooked by some loud music. The officer was writhing in pain in his leg. The incident caused a delay in the start of the parade. 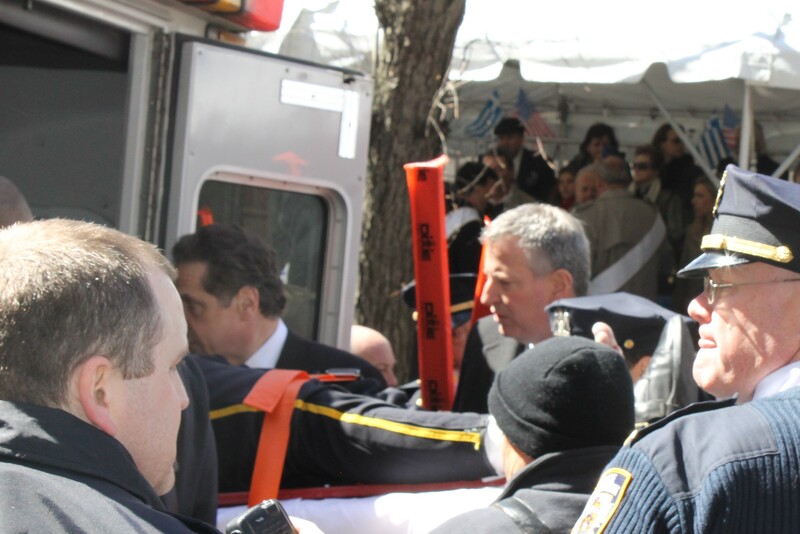 Once word got out that an officer was injured in the line of duty, both Governor Andrew Cuomo and Mayor DeBlasio rushed to the aid of the officer as he was being hoisted into an ambulance and rushed to Bellevue Hospital. Once the incident was under control, the parade kicked off much to the delight of the anxious crowd. 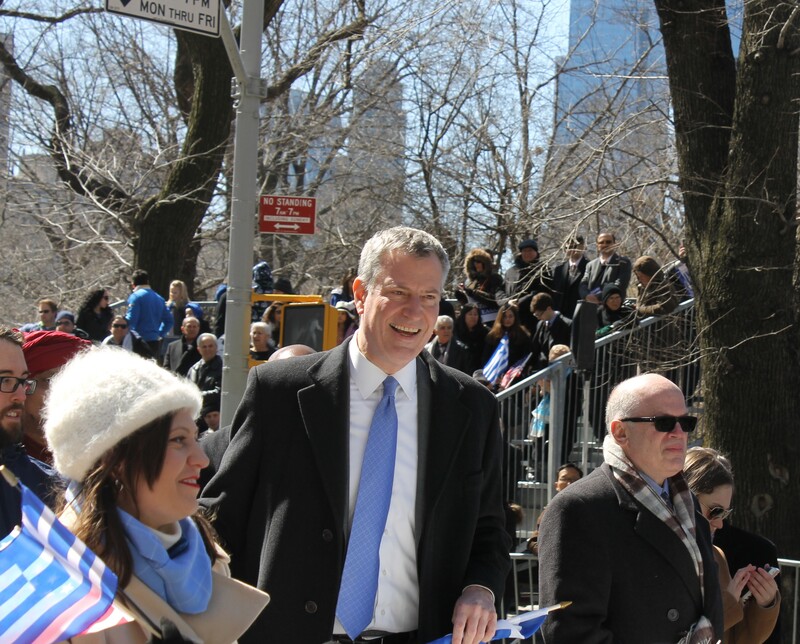 A Sea of Blue on 5th Ave.
Grand Marshalls NY Governor Andrew Cuomo, John Calamos, and John and Helen Psaras made their way up the parade route. 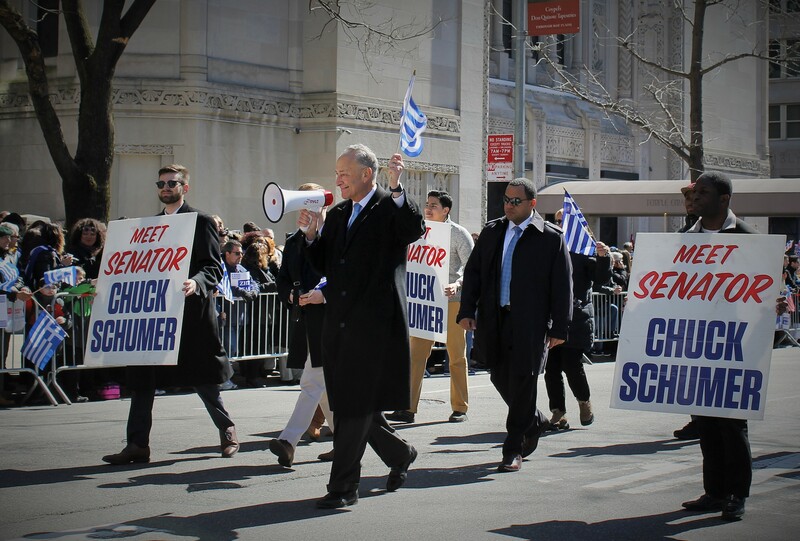 They were soon followed by representatives from Greece including the Greek Defense Minister. 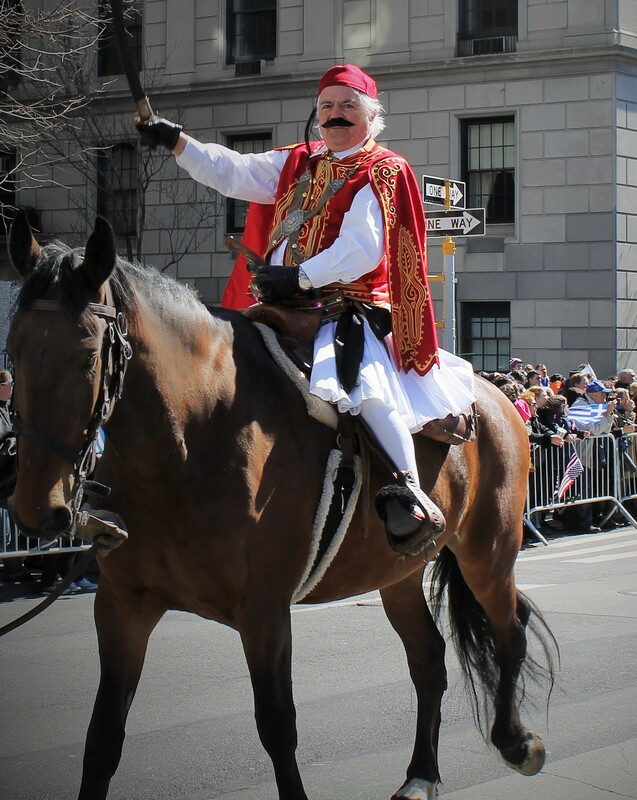 Greeks are a deeply religious people and have a great reverence to His Eminence Archbishop Demitrios, Primate of the Greek Orthodox Church of America. But what everyone was looking forward to was the perennial favorite, the Presidential Guard of the Republic of Greece, Evzones, marching with their signature steps. The crowd went nuts when they marched by. Several youth groups from Universities from Greece marched behind the Evzones. This was the first year several groups imitating the Presidential Guard participated in the parade. 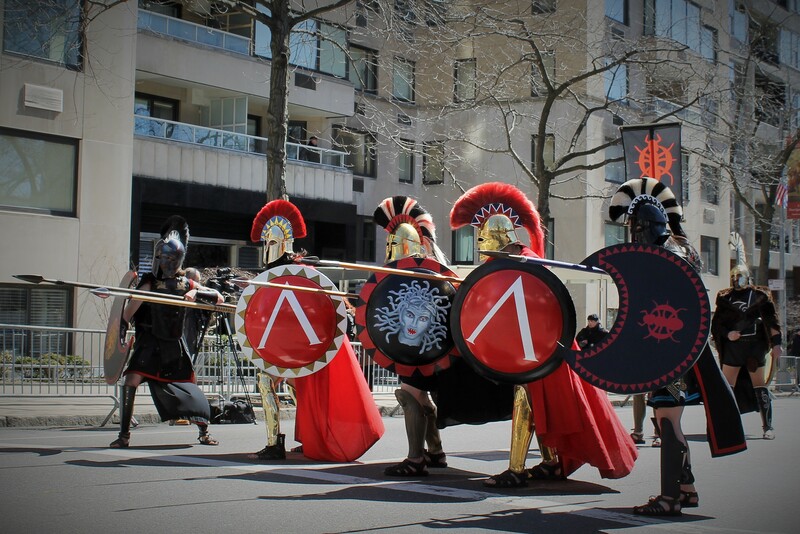 A group that always gets loud cheers are the Greek Folkloric group with their traditional costumes and the mighty Greek Warriors with their authentic Spartan warrior attire. They were placed strategically to protect the Greek Independence beauty queen float. 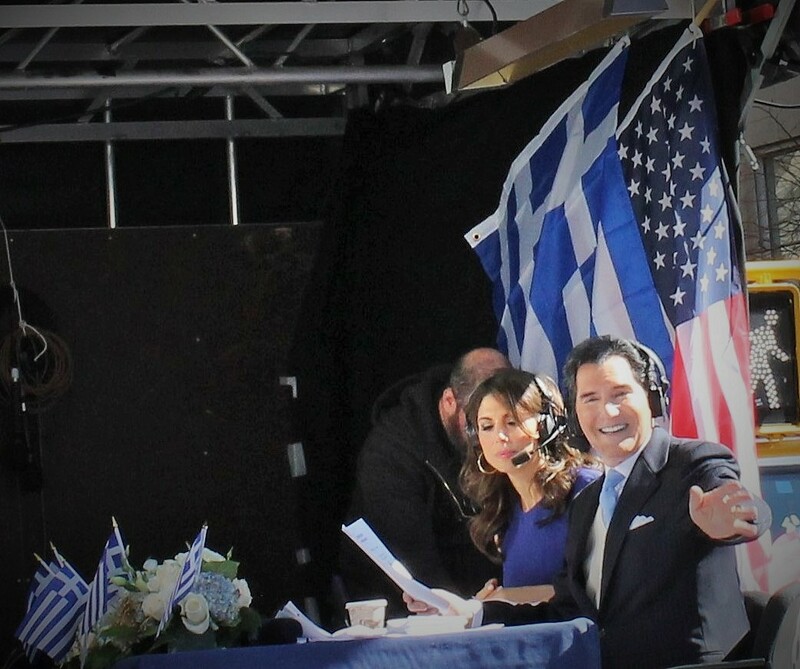 The parade was broadcast locally on MY9 and internationally back to Greece. Groups from Cyprus marched by with banners protesting the Turkish occupation of their land. 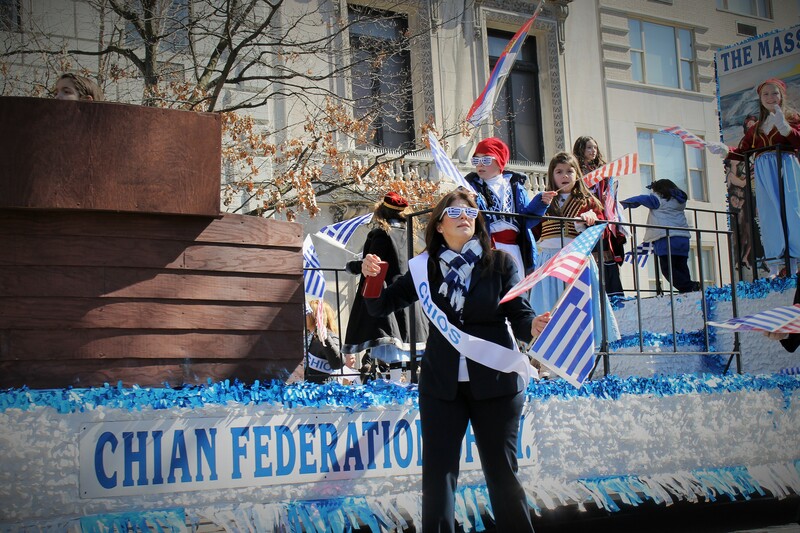 Other floats showed off the Greek contributions to civilization like democracy and a tribute to the famous painter “El Greco”. One marching band that looked like they were having fun were the Superior Sound Marching Band. 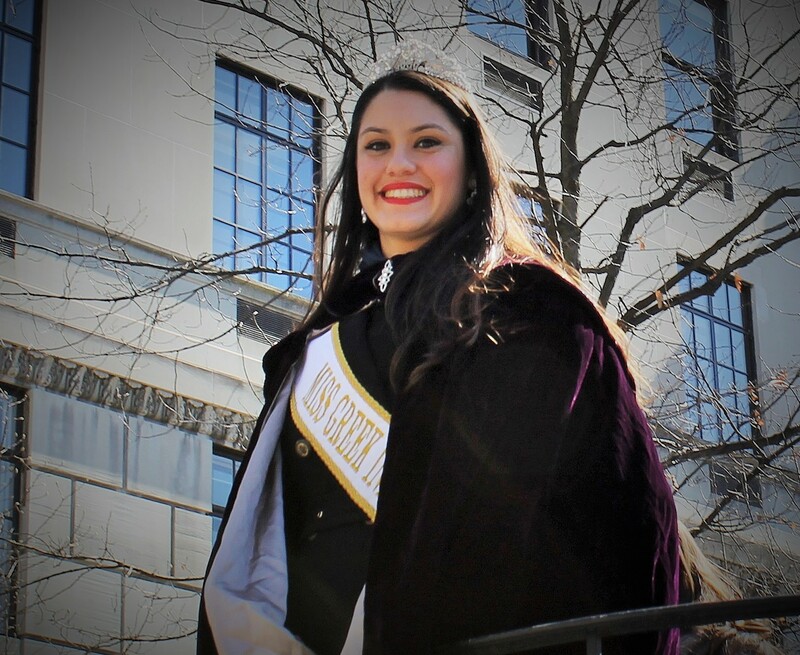 Greek Orthodox Churches from the tri-state area sent representatives to march. It was great to see revelers cheer on their fellow church members. This was a fun parade with lots of traditional costumes. Great to be Greek for a day. 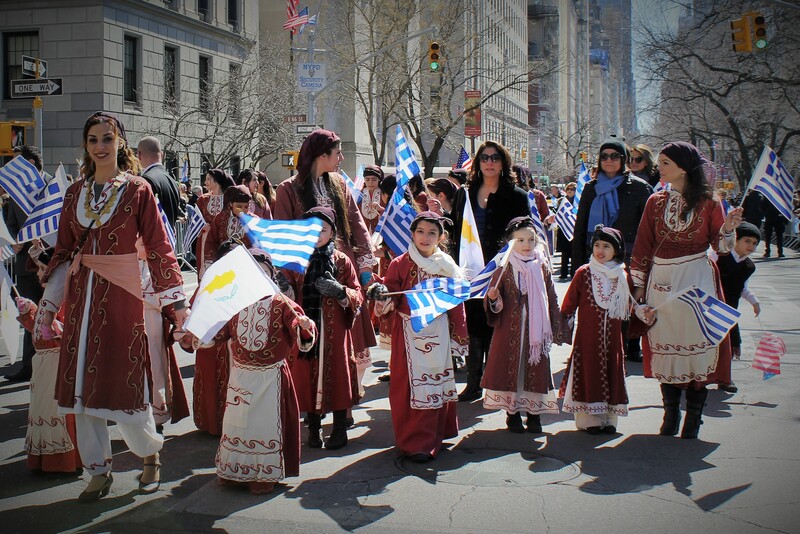 Greek Flags Flutter on 5th Ave. 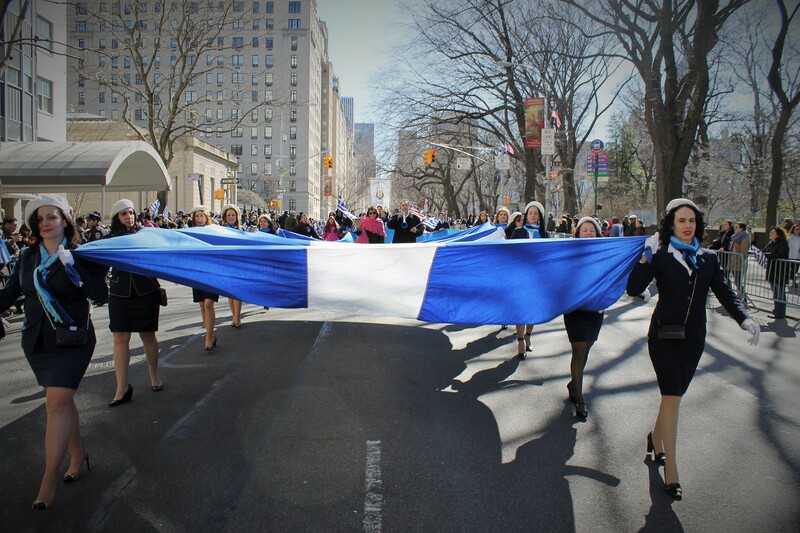 Body length Greek flags were used for warmth as a cold north wind blew the flags stiff all along 5th Ave. 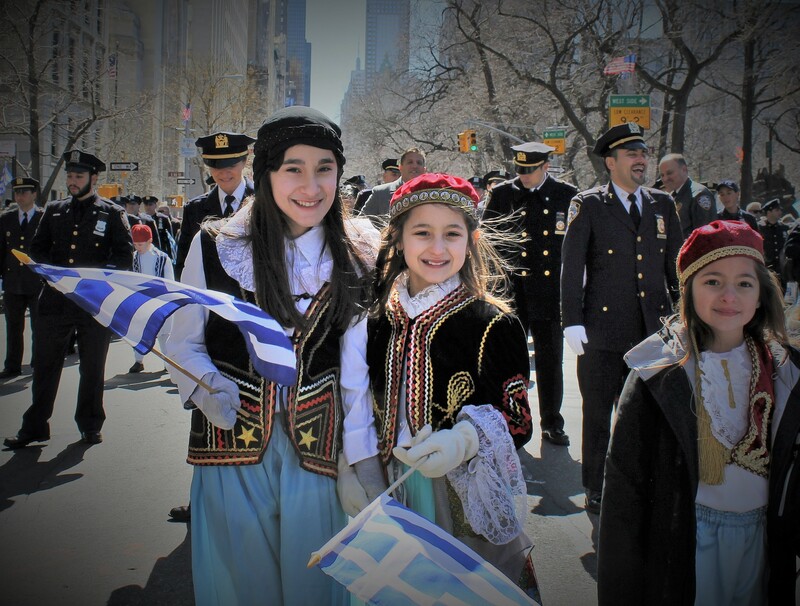 The winter like t emperatures did not stop the celebration and festive mood of the 73rd annual Greek Independence Day Parade. 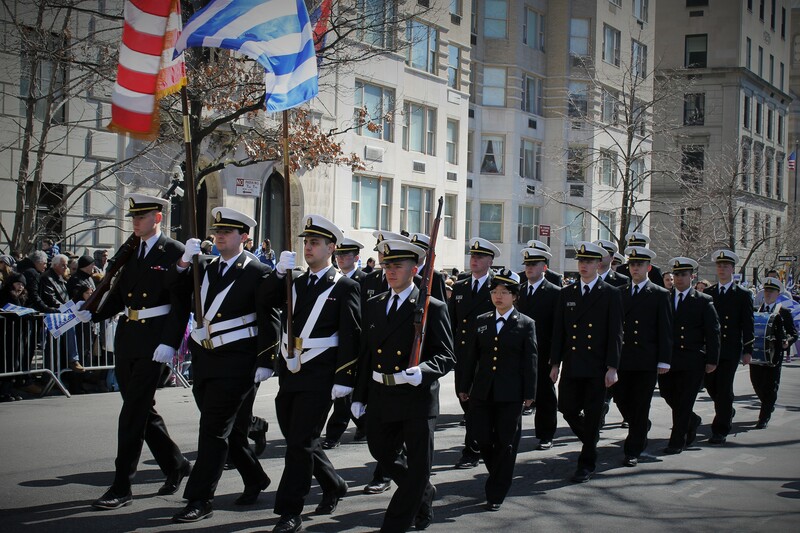 This year marked the 190 th anniversary of freedom for the independent Greek nation. 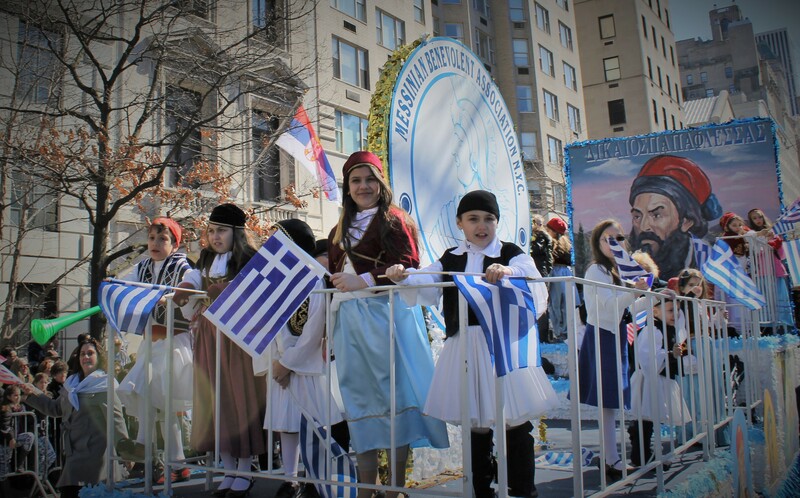 Many visitors from Greece came to participate in the larges parade of its kind in North America with over 100,000 viewers expected. Rachel and I couldn’t help but notice all the colorful traditional costumes worn by the marchers. Everywhere we looked there was a different costume and Rachel’s curious nature took over and she disappeared to take some great photos of the event. 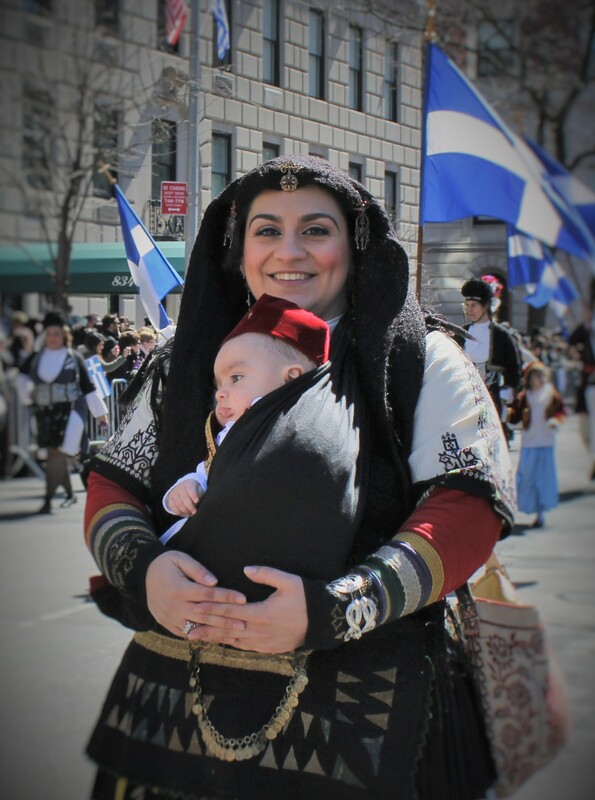 The pre-parade buzz was kicking into high gear mostly because of the bone chilling wind that made people huddle together for warmth while children in traditional Greek attire were jumping up and down. One young man I noticed was struggling to hold a banner straight. The tapestry on the banner was quite unique so I asked him what it represented. He said that was a duplicate of the banner raised by Alexander Ypsilanti in defiance of the Ottomans in 1821. The orginal banner is a national symbol of freedom and was on loan for the parade in Chicago. Lucky them. To the relief of many of the marchers, the parade began with mounted police riding up 5th Ave followed by the NYP D marching band and parade Grand Marshalls Demitris Kastnas, Dr. William Tenet and the Hellenic Caucus of the 112th Congress represented by Rep. Carolyn B. Maloney and Rep. Gus M. Bilirakis. A large applause was heard for His Eminence Archbishop Demetrios, Primate of the Greek Orthodox Church of America. 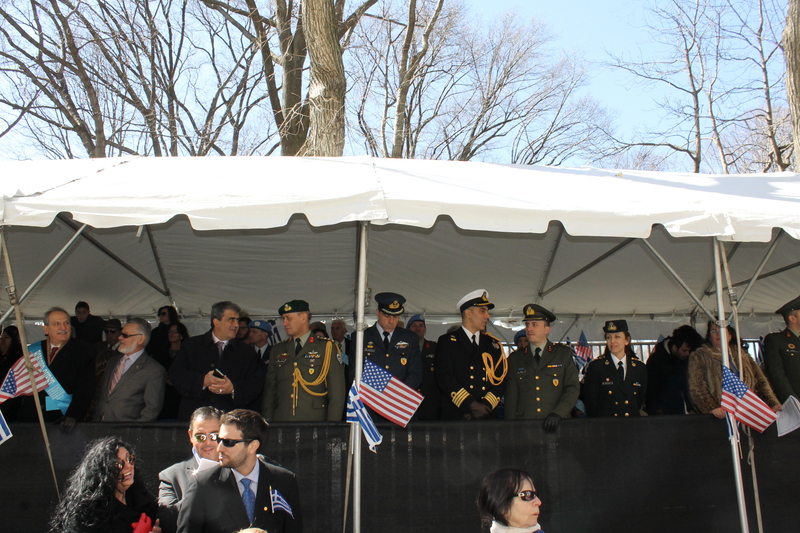 The parade sponsor’s President Elias Tsekerides of the Federation of Hellenic Societies of Greater NY soon followed with the Consul General from Greece and Cyprus nearby. Then the fun really started. 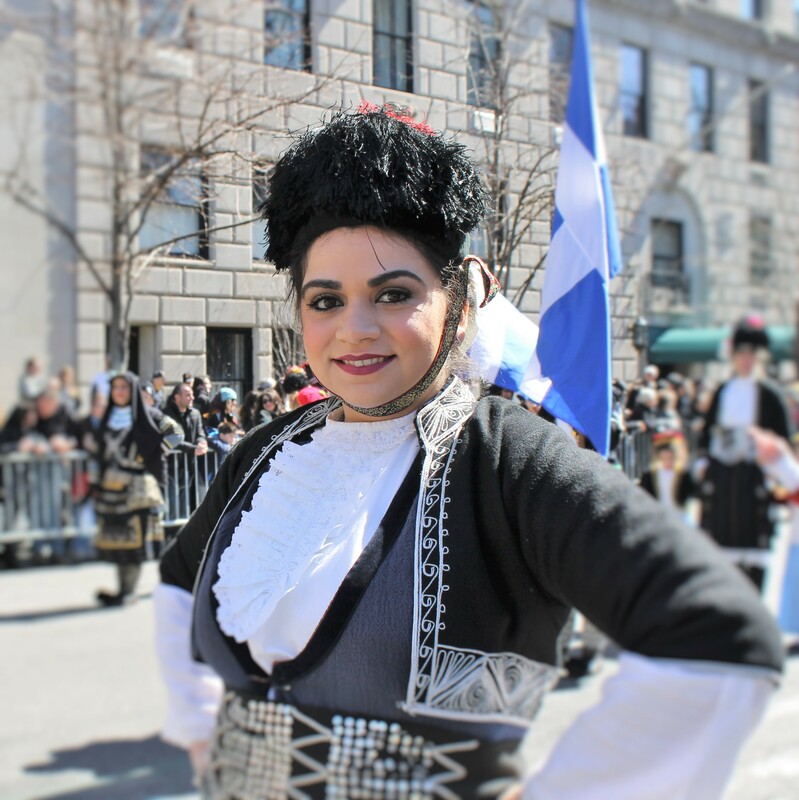 Awaiting their turn to march were the crowd pleasing Presidential Guard of Greece, the iconic ceremonial unit whose traditional uniform includes a kilt-like fustanella. Their famous high step march drew loud cheers from the crowd. 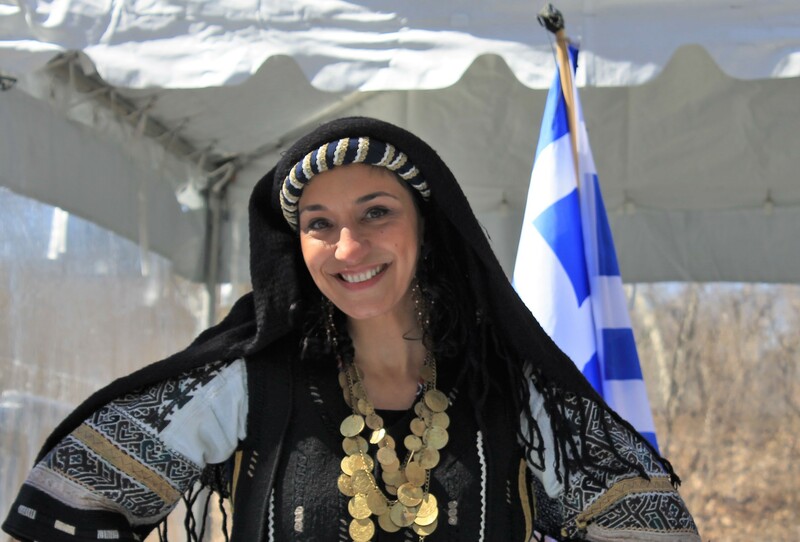 Another crowd pleaser were the Greek American Folklore Society with their decorative traditional attire and the Olympic Dancers from Pittsburgh showing off their victory dance passed down from times of war. Watching living history right before your eyes is always a treat for young and old alike and none was more evident than the Greek Warriors marching as a formidable unit with spears, shield, and helmets as though they were off to battle Persians or protect the lovely princess, Miss Greek Independence, on the float behind them. All the marchers were announced prior to arriving at the reviewing stand. 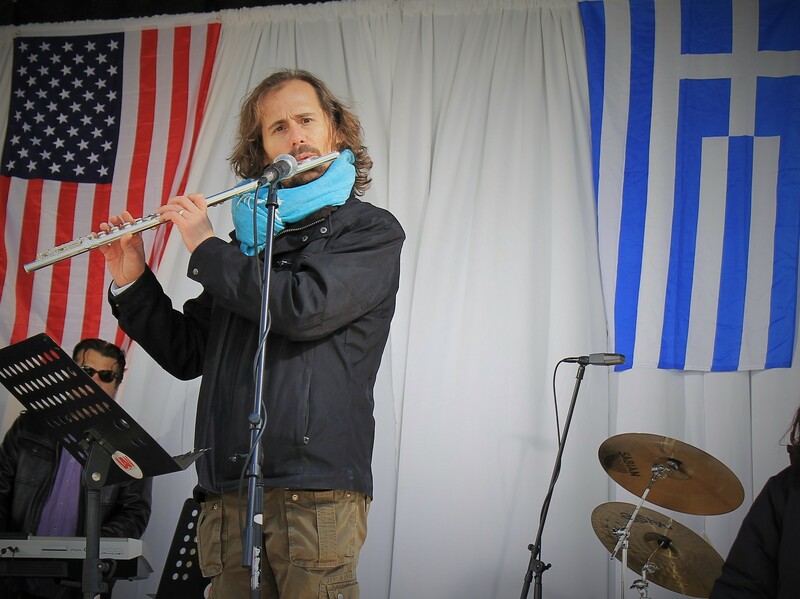 The dual purpose was for the live broadcast to both the New York ar ea and back to Greece and also to be reviewed by Archbishop Demetrios. 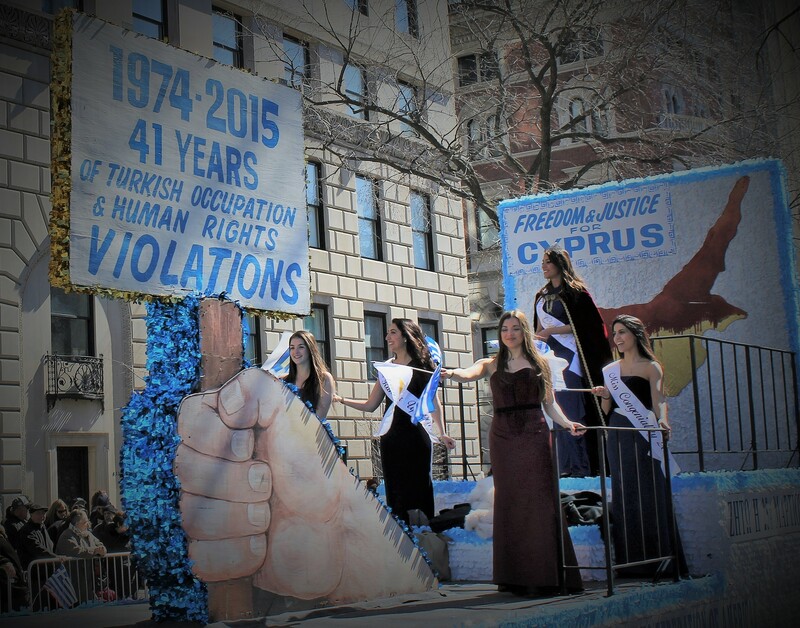 Some floats that followed depicted events and notable figures of the War for Independence against the Turks while others boasted about Greece’s contribution to Western civilization. One interesting float claims the first computer was built in Greece over 2000 years ago–Google it. 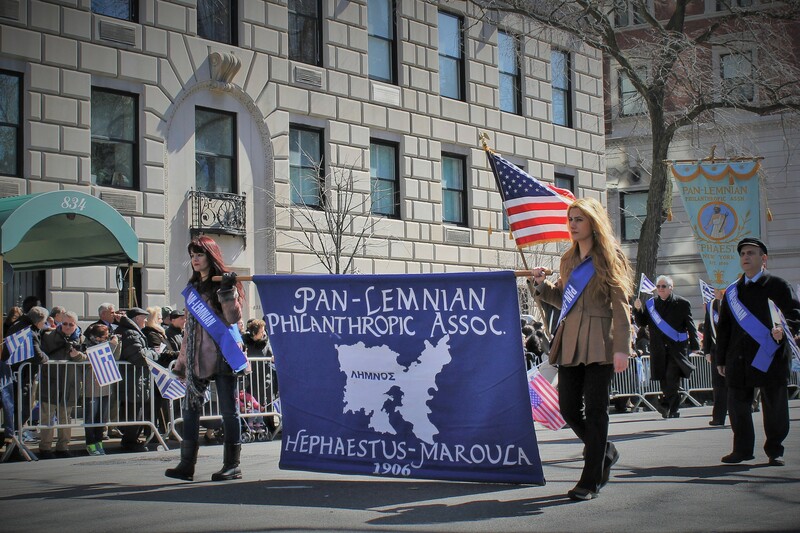 Altogether 42 floats, 16 marching bands and many Greek and Cyprus associations and churches throughout the tri-state region marched up 5th Ave. waving their flags proudly. Rachel caught up with me at the end of the parade route where we both noticed the look of elation on an in-line skater draped in a Greek flag. 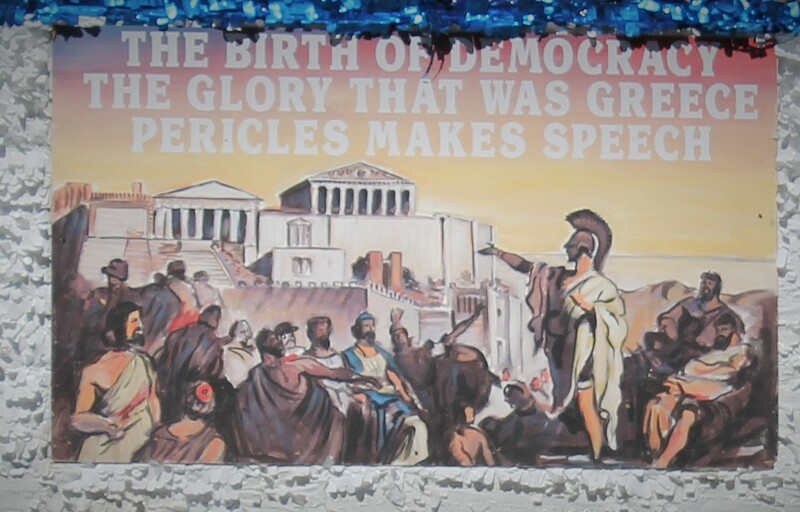 But what brought smiles to everyone was the enthusiasm shown by a little boy of no more than 4 years old walking alone waving his flag and screaming in Greek… Happy Independence Day everyone. Saturday April 9th. 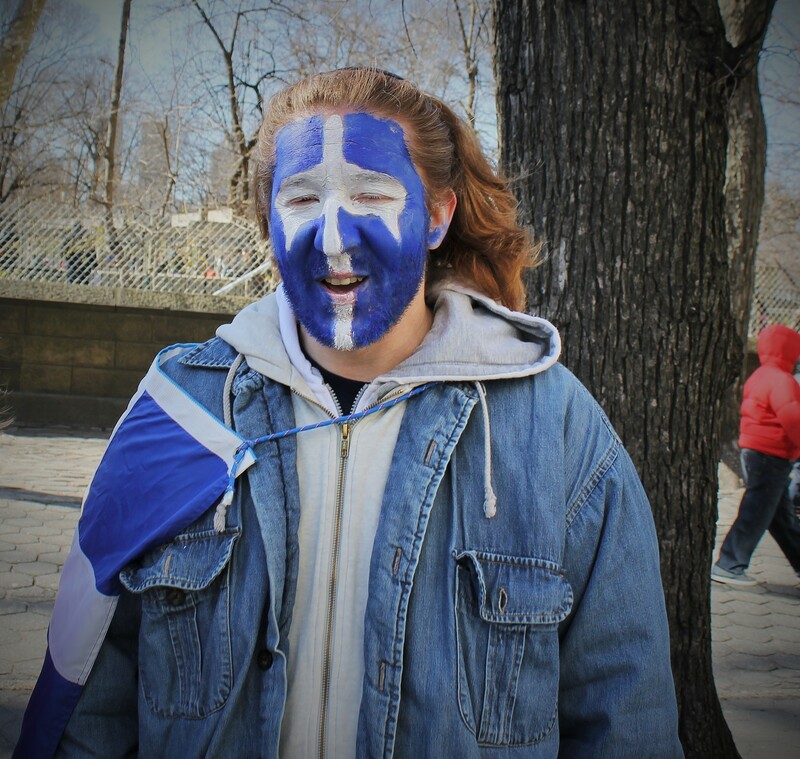 Tartan Day Parade. 6th Ave. 44th St 2pm. Sunday April 24th. Easter Promenade. 5th Ave. 49th St 10am.